CHICAGO – With “Transformers: Dark of the Moon” about to hit theaters and get the adrenalin flowing for major city destruction from another planet, you may be tempted to catch up with Jonathan Liebesman’s “Battle: Los Angeles” for a similar dose of macho male escapism. Don’t fall for it. This is an annoying movie that fails on nearly every level. “District 9” meets “The Hurt Locker” in Chris Bertolini’s screenplay, a piece that tries to take a man-on-the-ground war movie approach to an alien invasion. 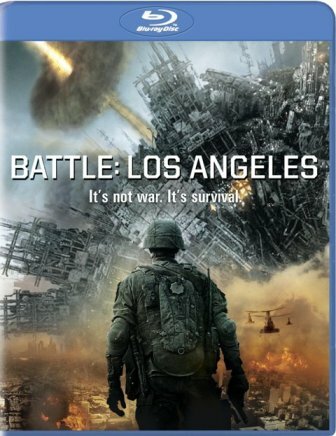 One of the biggest problems with “Battle: LA” is that it’s so derivative of superior films that you’ll just keep wondering why you’re not watching one of them. 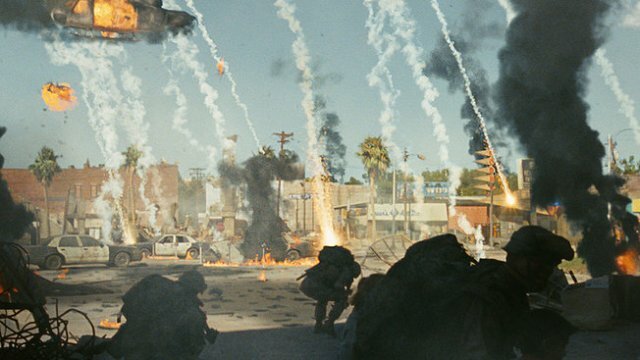 With horrible camera work, mediocre (at best) special effects, laughable dialogue, and direction that never grounds any of the action with something worth caring about, “Battle: Los Angeles” is one of the worst films released so far this year. And that’s coming from someone who had set expectations pretty high after the excellent marketing campaign, including one of the best Superbowl 2011 commercials. I was looking forward to it. I was just angry after it. Of course, they’re not mere meteors. When aliens start to march out of the ocean and begin an all-out assault on Los Angeles, it’s time for Nantz and his team to go to work. They’re forced to travel to a police station, save some civilians, and get back to an extraction point. Along the way, they pick up a Tech Sergeant (Michelle Rodriguez) and a few non-soldiers (Bridget Moynihan, Michael Pena). I really wanted to like “Battle: Los Angeles” but I can find flaw in almost every element from the poorly-conceived action sequences to the pathetically-derivative alien design. Even the shaky camera work is annoying as it’s clearly there just to disguise the fact that there’s not much going on. No characters, no tension, not even a single memorable action sequence. This “Battle” is just boring. Of course, the movie was made for HD and so it gets a few points for having an impressive HD video and audio transfer. Sony’s not about to mess up the best thing about their feature — the chance that it could numb you into enjoying it with its HD quality and booming Dolby track. The special features will be of interest to fans of the film, especially “Command Control,” which allows picture-in-picture behind-the-scenes featurettes. Once again, it’s a strong Blu-ray release for a weak movie. “Battle Los Angeles” stars Aaron Eckhart, Michelle Rodriguez, Bridget Moynihan, and Michael Pena. It was written by Christopher Bertolini and directed by Jonathan Liebesman. It is rated PG-13 and was released on Blu-ray and DVD on June 14th, 2011.